***COME CHECK OUT THIS YEAR"S PROPERTY UPGRADES!! Our Owners are Maine Outdoors Enthusiast Professionals. They take a personal interest in every guest who rents the property to ensure that they get to experience Maine as it should be... We make every accommodation necessary to make sure you will come back again and again! Imagine your own secluded hideaway located in the heart of more than 400 acres of undeveloped forests, ponds and streams, yet still within an hour's drive of all the best that Maine and New Hampshire have to offer... Hike, bike, swim, fish, enjoy the coastal beaches, local seafood, pick some strawberries or blueberries and so much more! Conveniently located only 2.5 hrs outside of Boston and just over 6.0 hrs from NYC, this hidden gem offers a peaceful and serene experience with plenty of opportunity to take in the natural beauty that will surround you. Enjoy the rustic atmosphere in this beautiful log facility made from lumber harvested from the property without sacrificing all of the comforts that you need. Take advantage of boating, canoeing or fishing in one of the many ponds, lakes, rivers and streams, go for a hike on the Appalachian Trail or on just one of the closer and less traveled mountains, take a short drive to Mt Washington or to one of Maine's many coastal beaches and seafood eateries. From the first hint of spring through the lazy days of summer, Maine is an outdoor wonderland. You can explore the coast, mountains, woods, rivers and lakes by kayak, bike or boat. Enjoy culinary treats that can only be found locally like blueberries and strawberries to Maine's clams, shrimp and lobster. Get to know the locals at a summer festival. With 17 million acres of Maine forest, and 400 acres at your fingertips, you are sure to experience all the outdoors has to offer. It is JUST YOU AND NATURE! 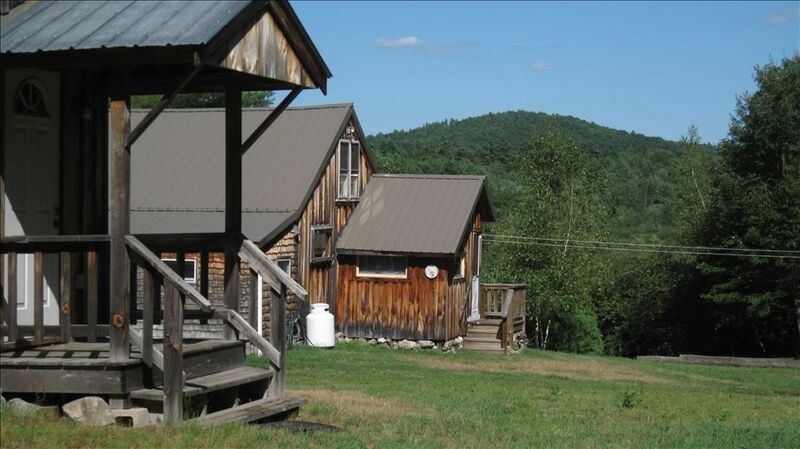 This wood cabin is located down a remote dirt road (approximately 1 mile from the main road) and is the only rental unit on the entire property, so you can be rest assured of a safe and quiet one-of-a-kind experience. The main building boasts an open kitchen and living area with commercial gas stove, dishwasher, refrigerator, cookware, utensils, full bath, heat and electricity. There is also a utility room that is equipped with a washer and dryer. A recreation building is available equipped with ping pong, professional pool table, air hockey, foosball table, darts and archery in case of a rainy day or slow evening. There is also a horseshoe pit set up adjacent to the picnic area. There is a queen bed in the main bedroom, a full-sized bed in the second room and 2 sets of bunks in the room off the kitchen. For parties of 10 or more (or those just seeking additional space), there is an adjacent bunkhouse house that can sleep eight (4-bunks) and is complete with its own fully functional bath (additional fees apply). Enjoy on-site access to all non-motorized water sports equipment (paddle boats, canoes, kayaks, row boats, etc. ), picnic and camp-fire areas, or outdoor recreational sports activities such as volleyball or horseshoes. We have Registered Maine Guides on-site available to provide Day Hikes, Canoeing, Kayaking or Fishing Day Trips, as well as Nature Tours and Outdoor Survival Skills Training Classes (for an additional fee). We request that these requests be made in advance so that we can make sure there is a guide available to take you during your stay. Reserve a day trip, class or tour with Southern Maine Guide Service at the time of your booking and get great discounts and offers!! Southern Maine Guide Service. Privately owned outdoor recreation guide business for more than 25 years and now two generations. Always innovative and creative in adding new activities and opportunities to enjoy the great Maine outdoors! Family owned. Sincerely private with no other rental properties on the premises. Friendly owner who will guarantee a pleasant stay! Privately owned land owner, forest conservation and wild life management practiced on the property, giving a top notch Maine wilderness setting experienced by few. toilet, shower, Available in bunkhouse for additional fee. NOW PROVIDED for all main sleeping rooms which can accommodate up to 10 guests. No cable. Basic local channels. Designated outdoor areas ONLY. At no time is there smoking permitted within ANY of the facilities. 3-acre private pond with swimming and dock access, fresh spring well, several streams, recreation house, bunk house, and multiple picnic and camping areas with mountain and water views, and outdoor fire pits. Swings, volleyball and horseshoe areas also available. Access to all non-motorized water sports equipment included with advanced rental packages (canoes, kayaks, paddle boats, etc.). Large mouth bass and brook trout available in water sources throughout the property. Multiple apple & berry picking areas nearby. This place had everything our group was looking for. It was very private and had plenty of space and activities for everyone. We loved the space (plenty of room in the main lodge, bunk house, and rec room) and the surrounding area. There is an awesome fire pit and plenty of near by trails. We didn’t take advantage of the guided trips (canoeing, hiking, etc) but will have to next time! Definitely recommend this destination! Absolutely Gorgeous Cabin in the woods! This is a perfect place to just get away from it all. There is plenty of room and everything that you need. The cabin is nestled in the woods so is very private. It rained one day so the kids had a blast in the rec room shooting pool, playing darts and air hockey. Ron was super nice and even came to show the kids the art of hatchet throwing. Beautiful clean private pond a short distance away that you can go swimming, fishing and just relax. Highly recommend! My entire family had a blast! This place is a hidden gem, so quiet and serene . The cabin is a great mix of rustic and comfort and we had everything we needed. We loved the views and walks, the game room, and especially the kayaking and swimming at the pond. My teens enjoyed the archery as well. Very enjoyable for our large family. We plan on coming back! The house and property are indeed very clean comfortable and nice. There is a lot of attention to detail and the place is very cozy. The game room is a lot of fun, and the grounds are in lovely shape! I don't think it was made clear enough just how remote this place is, nor the true nature of the access to it. This is a very rough and rocky dirt road; only SUVS and trucks should attempt to get down there. My hatchback took an absolute beating on this road and, had I know what I was in for, I would have avoided. Also, because of this very access issue, the pond is not quite as much of a feature as it is made out to be. You most certainly have to drive to it. This place would be great for a long stay, by folks who have a big truck and no interest in the outside world! For them this would be a wonderful spot. Great property for a getaway from the hustle and bustle. Ron was friendly and informative. Guests should know, though, that the swimming/fishing pond is not near the cabin -- it's about 2 miles away, next to the main road, so requires some planning/logistics for a group to get there. Our family decided to get away for Thanksgiving, something we had not really done before. Now we are thinking about making it a tradition. Everything you would need or want is there. We hiked in the woods, fished, played games in the game room, had an outdoor fire and practiced archery and tomahawk throwing. The weather was great, and we just had a relaxing time, wish it could have been longer. Ron is an attentive host and checked in with us to be sure we had everything we needed. I highly recommend this cabin as a wonderful, family vacation spot. Rates are subject to change until reservations confirmed. Large group rates negotiable. Half-day and Full-day event rental rates available for weddings, family reunions, etc. For availability or rate details, please inquire.